Probably one of the most immediate and widely used pictures of God comes from Psalm 23, which is sung at weddings and funerals, school assemblies and national occasions both in great cathedrals and local churches however small. This picture of God comes from the Old Testament yet Richard Dawkins writes in his latest book, The God of the Old Testament is ‘the most unpleasant character in all fiction: jealous and proud of it; unjust, unforgiving control freak; a vindictive, bloodthirsty ethnic cleanser; a misogynist, pestilential, megalomaniacal, sadomasochistic, capriciously malevolent bully’. Apart from the extraordinary, intemperate, language (which tells us a lot about the author and very little about the Old Testament), where is all this vitriol coming from? Dawkins uses the phrase in all fiction which by extension applies to his own writing about God. He is simply making things up to suit himself. Admittedly he is not the first person to misread the Bible (many Christians do it all the time!) but clearly he has not read the text with care and poetic imagination (not to mention scholarship) and reached a balanced view. As in all Shakespeare, a reader can find in the Bible anything he or she wants to find. But that does not exactly help when we are attempting to find truth and consider the various visions of God. So to be a bit more accurate, here are a few more sketches from the biblical picture of God which lead to a very different vision. A good deal of nonsense is written by many about a make-believe figure of God in the Old Testament. Look carefully and with insight and God is every bit as loving in the Old Testament as he is in the New. After all, Jesus came to know God as Father and the good shepherd by reading the Jewish scriptures. In addition, his prayers and daily relationship with God strengthened and deepened this vision. True, it led him to the cross BUT ALSO to the resurrection. Christingle Service 2006 – A big Thank you! The Christingle Service must be my favourite service of the year. St Mary’s was packed to the rafters, mostly with excited and happy children who were looking forward to Christmas. The Celebrate! music group did us proud with a mixture of modern and traditional hymns and, with the newly arrived Christmas tree twinkling in the corner, the special atmosphere was assured! The highlight, of course, after the distribution of the oranges, was the switching off of the lights and the lighting of the candles as we sang ‘Away in a Manger’. At the end of the service the children proudly left church sporting their oranges to light later at home and a total of £318.86 was raised for The Children’s Society! So a big THANK YOU to everyone who attended or contributed to this year’s total. Another big THANK YOU goes to the merry band of helpers who gave their time to assemble our oranges – it was a great team effort! Our love and prayers go to Clare Wood, who is currently teaching in Bishop Cotton’s Girls School in Bangalore. There are 3500 girls age 4-18, with 60 per class. Nearly all of them speak good English, and all teaching is done in English. Clare is hoping also to go and work in a more rural school and possibly in a hospital or program for female street children. If you have access to the internet have a look at clareinindia.blogspot.com where there are photographs and more information. The new calendar year started, as always, on 1 January. The church year, however, started a month earlier, on 3 December, Advent Sunday. Immediately Prestbury and All Saints’ moved into a new era as Fr Michael Cozens was licensed as our new priest-in-charge, rector designate of the forthcoming North Cheltenham Team Ministry. The day started with a major power cut, reminding us that we cannot take anything for granted, even electricity, and that we can always find alternative ways of doing things. The licensing, as the morning services in St Mary’s had done, took place by candle-light. Under Fr Michael’s leadership things will change. We shall be encouraged to explore new ways of doing things as a church, and we should not take for granted anything that we are used to. Best wishes for a blessed new year to all our readers from all the editorial team. We are running two courses this Lent. All are welcome to join us at either or both. The evening Lent group, led by Sue McLeish from Kemerton, will meet on Thursdays at St Nicolas’ and follow the Refreshed with Jesus video presentation of St Matthew’s Gospel, accompanied by readings from Bruce Marchiano’s book In the Footsteps of Jesus. Each session will include excerpts read from the book relevant to the Gospel chapters which then follow on video. After the listening and viewing, there will be opportunity for questions and discussion. These evening sessions will begin at St Nicolas’ on Thursday 15 February. Coffee will be served from 7pm and the sessions will start promptly at 7.30pm. NB there is no session on 22 February. 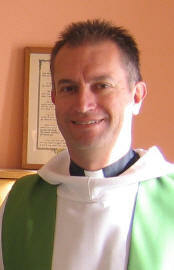 Our afternoon Lent Course will be led by Father Paul on Thursday afternoons in Lent at St Nicolas’. This course celebrates the life, work and faith of a great Yorkshireman and pays tribute to his work in combating slavery. Please sign up on the lists in church and order your course booklet, price £5. Money with order, please. Can we Build a Better World? will begin on Thursday 1 March at 2.30pm. There will be no session in Gold Cup Week, 15 March. We were in France, on holiday, in early January. We had bought a pie from the local patisserie and were sitting in the car, in the warmth, discovering what our non-existent French hadn’t told us, that it was an apple pie, when suddenly Neil bit into something hard. A little figurine of Mary, the mother of Christ, was discovered (or revealed), in his piece of pie. What was the meaning of this? We suddenly clicked – it was the celebration of Epiphany. That was why, when they had sold us the pie, they had also given us a cardboard gold crown. From this point onwards we found ourselves interested in discovering more of what Epiphany was all about. What better way to find out more about Epiphany than attending the events this year at both St Mary’s and St Nicolas’? At St Nicolas’, Andy Hughes taught us that Epiphany is all about the revealing of Jesus, as the Christ, to the wider world, when the wise men, or sages, came to visit Jesus. We learnt who these men might have been, how they might have understood what happened and how they might have journeyed in order to see this Christ-child (certainly not in a taxi or a car!). At St Mary’s we learnt more about the tradition that the church has always had, though forgotten by many, including us, of celebrating the twelve days, not before Christmas day, but beginning at Christmas and continuing for twelve days. We celebrated in a most enjoyable way, right in the body of the church with a full, sit-down dinner, miraculously produced from three stations within the church. To aid our digestion, between courses we were gently entertained with poems, drama (can anyone forget Cinderella?) and photos of how Christmas was celebrated at St Mary’s. To round off the whole weekend, in a fitting way, we remembered the importance of continuing to reveal Christ to the wider world, at the carol service following Andy’s Bible study at St Nicolas’ – how nice to sing some of the carols that don’t usually get sung, supported by the strength of the choir, with stimulating and interesting readings throughout the evening. The whole weekend was one of warmth and fellowship, a special time when those of us in the North Cheltenham Mission Area could get together, and find out more about each other. I just have one question left that needs to be revealed to me – what was the name of the tasty savoury pie that we ate at St Mary’s? I am not sure of the exact date that the Parish Events Committee decided on presenting ‘The Real Christmas’ and the ‘Epiphany Supper’. However, suffice it to say that both occasions were most enjoyable. The Real Christmas filled the church with a number of stalls selling items with a Christmas theme all in aid of a number of charities. Bell ringers supplied the entertainment and this was interspersed with carols. Seasonal refreshments were served while one learnt how to make Christmas tree decorations. A most enjoyable afternoon was shared with members of the churches of North Cheltenham together with our ecumenical friends in Prestbury. I trust the homeless children in the old and new world benefited a little and maybe next year the event could be more widely advertised. Now to the Epiphany Supper! Lynda has been heard to comment that the PEC has many ‘Indians’ but only a few ‘Chiefs’. She led her team of helpers most efficiently. She had planned her menu as only Lynda can, and solicited help with the cooking and transportation of crockery, cutlery, glasses, hostess trolleys, pews and much more! Around ninety people attended the Supper with representation from all our North Cheltenham Team of churches. A carol was sung and Fr Michael gave a prayer and a few words before the feast commenced. A delicious first course of pork and orange casserole, homity pie, bean casserole and sausages was consumed with relish with many second helpings. Several people performed a variety of entertainments before sweets were served. An audiovisual show of all the activities that took place over the Advent period was shown on a large screen, starting with the erection of the Christmas tree and finalising with Christingle. 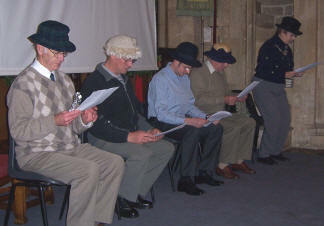 This was followed by poems and readings, culminating in the pantomime, ‘Cinderella’ performed by four male stalwarts of the parish and Marion. The second course was then served of lemon roulade, hazelnut meringues, custard pots and fruit salad. Needless to say there were plenty of second helpings of these delicacies. It was such a splendid evening people were loath to depart. Once again thanks to all the Parish Event Team and their helpers for another wonderful evening. Advent Sunday (3 December) was the beginning of the Church new year and for us in our Team Ministry of Prestbury and All Saints’ it also marked the beginning of a new chapter in the life of our churches. Much has been achieved in both St Mary’s and St Nicolas’. We are blessed with many people who are using their gifts in very many different ways. We have established work with children and young people which is respected beyond our parishes. We have launched and maintained Celebrate! at St Mary’s which has connected with a large number of people from the parish, especially families with young children. We continue to give excellent support to our local schools, particularly through those who work as governors. We are able to enjoy a variety of social occasions where we can deepen our fellowship with one another. We have good systems in place to offer pastoral care to the bereaved and to people in other kinds of need. We have buildings which are being well looked after and also well used, not only on Sundays. Most importantly, on Sundays and throughout the week, we are able to offer to God worship that speaks clearly of our love, our thankfulness and our praise. None of this happens without a great deal of time given by so many people and I would like to express my thanks to all of you who contribute to the life of our churches in any way, especially worshipping with us! However, all of this also costs money. Just like every household, our churches face costs which increase every year. You will know how your gas and electricity bills have gone up and so you will appreciate how the costs of running our churches have increased. Of course this also means that the cost of anything we do as part of our Mission – our call to spread the message of the Good News of Jesus Christ – has also gone up. On behalf of those who so conscientiously and carefully manage our finances, I am writing to ask you to consider prayerfully your financial contribution towards God’s work in Prestbury. Please think about whether you are able to give more. Please think about whether you are able to commit to a regular amount; this is so much more helpful for paying the bills. Please consider gift-aiding your donation if that is possible. Do ask to speak to someone if you would like to know more. Money is always a difficult issue to raise and it is unfortunate that I should have to do so in only the second month of my appointment as Priest-in-Charge, however it is vitally important if we are to be able not only to ‘pay our way’ but also to fund God’s work in the future. Please take some time to consider this prayerfully. If you have not received a copy of this letter, please collect one from one of the churches and then make your response to God’s generosity by completing the reply slip and returning it in the envelope provided. Your response can be placed in a collecting bowl in church, or sent by post. I enjoyed my visit to the Khel Toys from India exhibition at the Cheltenham Art Gallery, with its variety of colourful objects, many of them made from recycled materials. I was attracted to the simple clay figures of birds and animals and it reminded me of some of the pottery pieces I made on a course up at the Art College. When Fr Grant was speaking in St Mary’s about the defection of the boy Jesus from his family whilst on a visit to the temple in Jerusalem, he spoke about how little we know of his family boyhood. Was the story true that he also made small clay figures of birds and, when reprimanded for this, he told them to shoo, and they flew away? It was one of those many moments when you wish you had been there. Later, when we went up to the rail to receive communion, I contemplated the nativity scene created under the altar. Here was another colourful Eastern scene which reminded me of the one in the art gallery and I thought how close we all are at times, and yet divided by stupid superstitions between races and cultures. May this New Year help to bring us all closer and make us capable of better understanding. In February 2006 Fr Grant came to visit me and welcome me to the Parish. I was introduced to the Daily Service of Evening Prayer. This quarter-hour service at 4.30 has filled a need in my life, with Canticles, Psalms, readings from the Bible and of course Prayers. An exciting exercise of getting to know the book of Celebrating Common Prayer and a lovely way of meeting other members of the Church I ‘nod to’ on a Sunday morning. Perhaps it is necessary for our souls to be rattled out of a routine service for a while, time to look where we have been and encourage our new-found spirituality on to a new plane. So the shepherds returned to their flocks and to their old lives, on the fringes of respectable society. They would never lose the memory of that one night when they were chosen to be the only witnesses of amazing things: a choir of angels and a wonderful child in an animals’ manger. Mary and Joseph were left alone at last with their newborn baby. In their makeshift accommodation, life began to settle into a routine. No more visits from angels to give instructions on baby care, but plenty of advice no doubt from older women in Bethlehem. Like any Jewish parents, they set out simply to do the right thing for their child. When he was a week old, he was circumcised and received his name, in a simple ceremony at home, possibly carried out by Joseph. After a further month, they took him to the Temple at Jerusalem, eight miles away. Here there would be two public ceremonies: the infant Jesus was presented before God, in memory of the time when every first-born son was appointed a priest in the desert tabernacle, and for Mary, as for every new mother, there was a ceremony of purification and thanksgiving. As it turned out, this temple visit was not quite like those of other new parents. Two devout and respected worshippers, a man and an old woman, were both inspired to prophesy over Mary’s tiny baby. But then it was all over and the little family group went back to their temporary home. Soon they would be forced to leave Bethlehem in fear, to live for a while as refugees in Egypt before they could return and settle down to a quiet existence in Nazareth. In all these years, as they survived and worked and cared for their son, they were granted no divine advantages. Mary thought often of God’s promise that her child was special beyond all others, a king like David, even the son of God. It seemed a long way from the day to day reality of a growing child. But in this ordinary time, they were no less the Holy Family, Jesus was no less the promised saviour, God’s care never left them. Here in our 21st century existence, the church year will soon move on from the final days of Epiphany. Lent is coming soon, but for three weeks we shall be in ‘Ordinary Time’, marked by the colour green for vestments and service books. In this quiet interlude, our worship and prayers will be no less valid – we may even find it a relief to be ‘back to normal’. In our personal lives, a lot of our weeks and months are ‘ordinary’, passing without great highs and lows. But throughout these quiet times of small problems and partial successes, we are no less cherished by our heavenly Father. Underneath the dull surface of the everyday, there is growth. One day we may know how much. On 1 August 1907 Lord Robert Baden Powell – ‘BP’, hero of the siege of Mafeking during the Boer War – opened an experimental camp on Brownsea Island in Poole Harbour. He brought together teenage boys from Public Schools and deprived areas, formed them into small groups, had them living in tents, cooking their food on open fires and taking part in a variety of adventurous activities. The experiment was a success and the Scout Movement was born! Today there are Scout Associations in 155 countries as members of the World Organisation of Scout Movements (WOSM) with over 28 million members. There are also 26 associated countries, 35 countries where Scouting is known to exist in some form and six where it is not permitted. BP wrote the handbook ‘Scouting for Boys’; girls quickly took it up and the Girl Guide Movement was formed in 1910 led by Lady Olave Baden Powell. There are now girls in the UK Scout Association as in most countries. At 8am on 1 August in each time zone around the world the Scouts there will gather to repeat their Promise. From 27 July to 8 August 40,000 Scouts from 216 countries will camp at a World Jamboree in Essex, living, working and playing together. They will also have ‘Home Hospitality’ throughout the UK before and after the camp. On the weekend of 27 May every Scout should have the opportunity of a Centenary camp locally. There will be many other activities locally, nationally and throughout the world. All Scouts past and present will be welcome at these events. From the 1920s there was a Scout Troop in Prestbury and old glass lantern slides show them meeting in a hall on the site which is now the King’s Arms car park. The Revd Harry Hartley acted as a Scoutmaster when he was a curate here. The troop closed after a 12-year-old scout drowned in August 1947; his grave is in the churchyard. The Group reformed in 1951 with a Cub pack, Scout Troop and Senior Scout Unit, meeting in the room over Tatchley House garage, Tatchley Lane. They moved to their present headquarters in the Burgage in 1974 at a ‘peppercorn’ rent to the Clergy Pension Board and bought it from them twenty years later. The Group is currently located in the Burgage and is very active. The Group consists of Cubs, Scouts and Explorer Scouts. There is also an active Executive Committee, chaired by Paul Brown, which takes care of raising money (mainly through jumble sales) and maintenance of the property. We have a Cub pack of around twenty with a waiting list of half-a-dozen boys. Andrew Jackson and Bruce Bennetts, the leaders, operate an exciting programme with activities ranging from making model cars and hot air balloons to games and camps. The Scouts have recently acquired a new leader, Duncan French, supported by Steve Downward and Phil Morris. 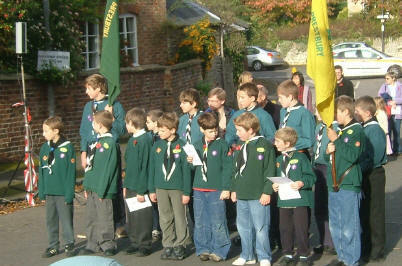 The Scouts are divided into four patrols and have a programme arranged around six challenge badges. Activities include lighting and cooking on open fires, pioneering (making structures by lashing poles together), and camping, which often includes canoeing, archery and climbing, as well as more traditional activities such as night hikes and wide games. The Scouts are currently undertaking a number of badges which include Mechanic, DIY, Cooking, and Craftwork. The Scout Group also benefits from having an Explorer Scout Unit located at the Burgage, with two leaders, John Powell and Andrew Butcher. Explorer Scouts are a new Scout section made up of boys and girls aged 14 to 18 years and managed at district level. The programme is linked to the Duke of Edinburgh Award Scheme and the Scouts engage in a wide range of activities that they organise themselves with the help of leaders. 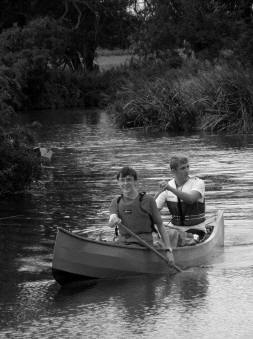 Last year the Explorer Scouts built a two-man canoe and organised a five-day canoe-camping trip on the Thames. The ‘Black Sheep’ Explorer Unit won the Silver trophy for the Cotswold Marathon last year and they are planning on building another canoe and doing a ‘survival skills’ course during the current year. There are currently ten Explorers and we are actively seeking more boys and girls who might be interested in joining. Explorers meet on a Tuesday evening at the Scout HQ. At the end of last year two members of our congregations were given awards by the Scout Association. Though no longer actively working with the young people, Bob Lyle and Alan Jackson are still supporting Scouting in the Scout Fellowship and several local District Committees. Bob’s Scouting started in Kent. On moving into Tatchley House several years later he discovered he had also ‘bought’ a Scout Group! He became ‘Honorary Troop Surgeon’, then Group Scout Leader. He progressed to District Commissioner and later County Commissioner. Currently he is a County Vice President and President of Cheltenham District. Alan’s Scouting began in Lancashire, where he progressed to Assistant Scout Master. A few years later in Cheshire he became Senior Scout Master of an Admiralty Recognised Sea Scout Group. Unusually their boat was a canal narrow boat. There he also became District Scout Leader and a Peak Forest Warden. Moving to Greater London he took on the role of Group Secretary, then Group Scout Leader, then district Commissioner. Now in Prestbury he is Chairman of the Cheltenham Scout Fellowship. The Scout Association is always appreciative of support given to the Movement in this way and at a gathering in Tatchley House in December the District Commissioner presented awards for 60 years service to Bob and 50 years to Alan. Thank you to everyone who collected or is still collecting postage stamps for me. The Scout Holiday Homes Trust provides wheel chair accessible caravans at several places around the British Isles. This year’s project is for caravans at Hoburne Naish and Hoburne Torbay – each is a double-glazed 37ft x 12ft Pemberton Sovereign with wheel-in shower. This seemed to be the perfect answer to hot potatoes in a church with no kitchen so I concocted this recipe since I couldn’t find one in a book. Grease the tin of your choice well with margarine or butter. Roll out pastry fairly thinly then line the tin. Prick over the base with a fork and line round the pastry sides with a strip of cooking foil folded over several times to make it stiff. This will stop a major collapse of the sides of the pastry case as it cooks. Bake in a moderate oven, about 160°C, until nice and firm but not completely done, probably ? of the usual cooking time. In the mean time mash the hot boiled potatoes, beat in the soft fried onion, milk, butter, mace or nutmeg, salt and pepper to taste. Fill the almost cooked pie case generously with the mashed potato mixture, rough-up the top with a fork and sprinkle with a covering of grated cheese. Put it back in the oven and finish cooking until pastry is done properly and the cheese has melted and bubbled. Serve hot with meat and other vegetables or enjoy it on its own, perhaps with a side salad. The cooled pie can be wrapped and frozen. When wanted it can be cooked from frozen like any supermarket ready meal. Line 2 swiss roll tins with non-stick paper. Whisk the egg whites till firm and dry, add the sugar a little at a time. Add the 3 other ingredients and whisk. Spread out on the tins (sprinkle sliced almonds on top if liked) and bake for 15 min at 180°C. Cool in the tins and turn out onto cling film, peel off the non stick paper. Whisk cream and spread on the roulades (save some for piping rosettes down the top if liked). Cover with sliced fruits in season. Alternatively spread with lemon curd or chocolate spread – before you put the cream on. Roll up using the cling film to press the roll together. Decorate and dust with icing sugar. Freezes well (not sure about with the fruit in). Thaw out at room temperature for 1 hour. Many people requested this recipe at the Epiphany supper. It was given to me by a friend called Biddy who is a professional caterer, hence its name. On Tuesday 19 December thirty children from Prestbury St Mary’s Junior School gathered together to perform songs from Puss in Boots, their school Christmas production. They began at the local library and sang several songs from their production to a very appreciative audience. They continued their journey to Bay Tree Court where they repeated the recital to the residents there. This is the second time the children of the Junior School have shared their joyful singing with older members of the local community and they hope to continue this in future years. Once again plans are being made to host another of our very successful Children’s Activity Days. These days are an essential part of our ministry with children and involve many people from across the team. In the past we have followed a theme, with the previous two based on Moses and Joseph. This time we have decided to focus on the New Testament and explore the stories Jesus told – The Parables. If you would like to be involved in this crucial mission work amongst our children then please contact me. There will be a meeting on Monday 12 February in St Nicolas Church Room. I have already distributed application forms to all those who have expressed an interest in joining our 2007 pilgrimage to Walsingham. If there is anyone else who may be interested and would to like to know more, please contact me. The overall price this year is £116.55 (children £69.93, under 5 – free) and this covers accommodation from the Friday night and all meals from breakfast on the Saturday up to and including breakfast on the Monday. I would be grateful if booking forms and a non-returnable deposit of £10 could be returned to me by Tuesday 20 February. For those who have access to the Internet further information on Walsingham can be found at www.walsingham.org.uk. This month’s bakestall at St Mary’s is on Sunday 18 February with contributions from those with surnames N-Z. Do contact one of us if you would like to join the rota. Our February meeting will be held on Tuesday 27 February at 7.30pm at St Nicolas’ Church. It will be our AGM followed by a Eucharist Service led by Fr Michael. We shall also renew our Mothers’ Union promise. Any new members will be most welcome. 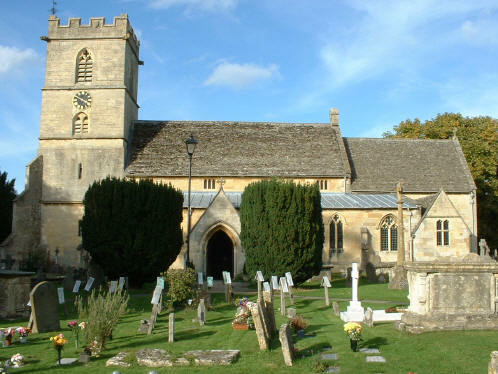 Saturday 10 March at All Saints’, from 12 noon to 4pm beginning with a light lunch of soup and rolls. Our Annual Church Meeting will take place on Sunday 25 March. Prior to this meeting I have to prepare a report which needs to include a small ‘thumb print’ paragraph from each committee that reports back to the PCC. If you are the chair of any committee, or work in a specific area that needs to be mentioned, I would be most grateful to receive your short article by Friday 16 March. With many thanks. On Saturday 17 March at St Nicolas’ Sarah Lyle will be giving an illustrated talk about her expedition last year from the Dead Sea to Mount Everest. Details next month. Does the idea of spending a residential weekend working in beautiful gardens appeal? Glenfall House, with its special atmosphere, renowned welcome and good cooking, is running a weekend to help maintain the landscaped four-acre grounds. It is suitable for both novice and experienced gardeners. Day visits may be possible for local residents. Please telephone if you are interested and I can supply details of cost and application forms. The Plant Sale at St Nicolas’ will be on Saturday 12 May. As we plan to grow on geraniums, etc for you, may we appeal for small square plastic plant pots? If you have some to spare, please bring to me or give me a ring and I will collect. Our Parish weekend will take place at Sidholme in Sidmouth. For those who have already booked, you should by now have received the information from me. If you would still like to join us we have about twenty spare places – please ring me as soon as possible for further details, or you may find you have missed the boat!! It is a good way of enjoying relaxed fellowship with fellow church members and there is no pressure to join in anything that you are not too sure about. Just come to enjoy the hotel, food, swimming, beach, or whatever else you may wish to do. The collection from the Christmas card scheme enabled us to send a donation of £210 to World Vision. This was the best ever, and thank you everyone for all your kind wishes and generous donations. At the 10.30am Thursday Eucharist at St Mary’s we raised £400 last year for the Church Heating Fund. After the service we meet socially for a cup of coffee and biscuits, for which we usually pay 50p. We started this function on 18 February 1999 and we first of all raised £500 for Let the Children Live!, and then in November 2000 started raising money for St Mary’s Heating Fund. Our Grand Total for the latter is £2,300 to date. Thank you to everybody who has supported us, whether by donation or by helping in any way. A great achievement and a much warmer church. It would be nice to see some new people joining with us for this lovely half-hour service on Thursdays, after all, only half an hour out of your week. Many thanks to our choirs and friends who sang carols for Christian Aid at the new Sainsbury’s store in Priors Road. St Mary’s raised £133.62, St Nicolas’ £100.04 and Churches Together, singing in supermarkets all over the town, raised more than £2,445. A fine result! Thank you, too, to everyone who put the price of a Christmas dinner in an envelope, totalling £189.00 from the two churches, and thank you for supporting Present Aid. One friend told me that she would have preferred to be consulted before presents were given in her name. I should be interested to hear what other people think about this. It is, of course, possible to avoid the problem by asking friends and relations to send us these ‘presents’ instead of others which they might have given us, but to refrain from sending them to people who might not share our views. What do you think? NB Christian Aid Week comes round in May. More helpers are urgently needed, especially at St Mary’s. In particular Gill Ashman is looking to hand over the organising at St Mary’s. PLEASE get in touch with us soon if you could help. Very many thanks to all the box holders who have helped to collect a total of £450.87 during 2006. Thanks also to Enid Cowley who patiently helps me to count all those pennies. I’ll be glad to open your boxes again: please give them to me on a Sunday morning or contact me and I will be glad to collect. Thank you to all volunteers and workmen who, when they see me approaching must think ‘what is she going to ask me to do next’ and hearts must drop. Without you none of the agape, teas/coffee, cakes and Parish Events would take place. We are always looking for new ideas and inspiration. If you would like to join our Merry Team please see me or one of us or the clergy.